Here at Maxtop, we’re lucky to work closely with some fantastic distributors and retailers in the kitchen industry. From Scotland to the south of England, these distributors span the length of the country in order to serve our kitchen needs, so we thought we’d take the time to introduce you to them. First up, we’d like to introduce you to nationwide kitchen retailing giant, Magnet. Magnet was founded in 1918 in Bingley, West Yorkshire. Legend has it that founder Tom Duxbury traded his horse for a firelighting company and named his new company Magnet after the horse! Nearly 100 years on, Magnet is now a kitchen retail giant which can be found in over 200 locations, covering all corners of the UK. From helping you to design your kitchen to offering a wealth of advice and inspiration, Magnet covers a host of bases. Magnet boasts over 50 kitchen styles to suit a range of tastes and budgets, whether customers are looking for luxurious fitted kitchens or great value, ready-to-assemble kitchens, ready to be complimented by our Maxtop surfaces! Customers can make appointments with kitchen designers to discuss interior design ideas and they can also create their own kitchen design using the virtual kitchen planner. Magnet also pride themselves on providing a ‘full circle service’, which incorporates home surveys, smart design, personalisation, making to order, installation, home checks and smart care in the customer’s journey! 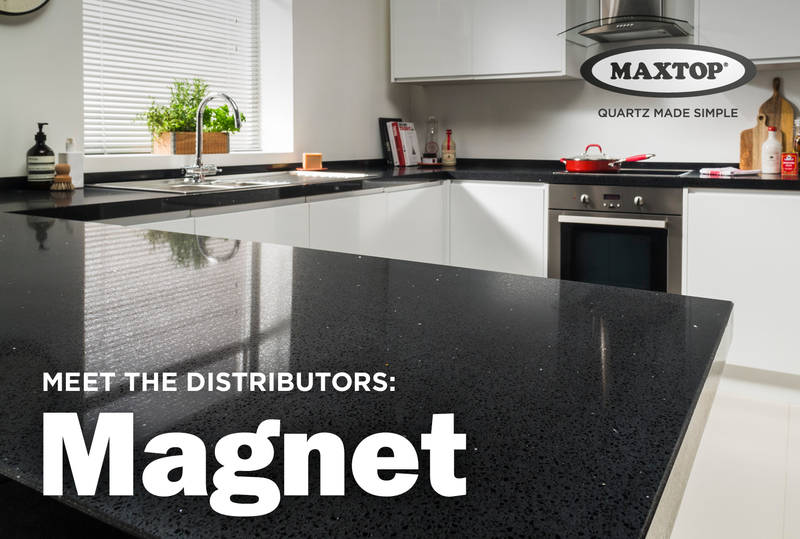 “The great look of Quartz for less cost” – if you’re looking to add Maxtop Quartz surfaces to your new kitchen, Magnet stocks our very popular Diamond White, Black Sparkle and Warm Grey finishes. There are hundreds of showrooms around the UK and you can find your nearest here. Magnet Trade also supports the trade industry, with thousands of products ranging from screws and fixings to kitchen cabinets, all at trade-only prices. They also have some great news, advice and tips to explore here, with everything from new season styles, improving outdoor security and advice on window glazing explained. For the latest updates, make sure you’re following us on Twitter and Facebook.